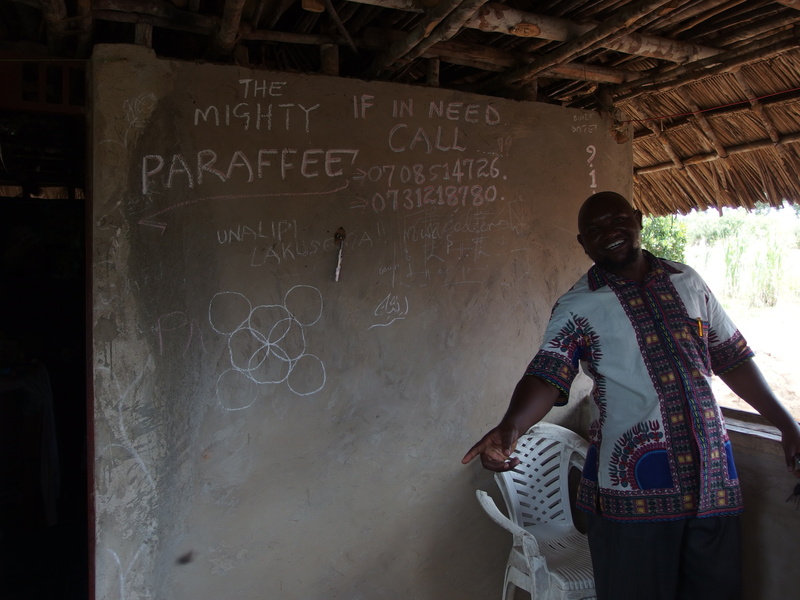 I traveled out to Kwale on the Kenyan Coast and celebrated Eid (the end of Ramadan) with my friend Juma and his family in Mwachinga. It was a great time for everyone (except the goat). It rained on and off, but the ladies made up some great Pilau and the men had some conversations about Islam and witch doctor Senators. Juma even gave us a detailed family history. Finally, everyone had a serious discussion on the impacts of social media on family relations. 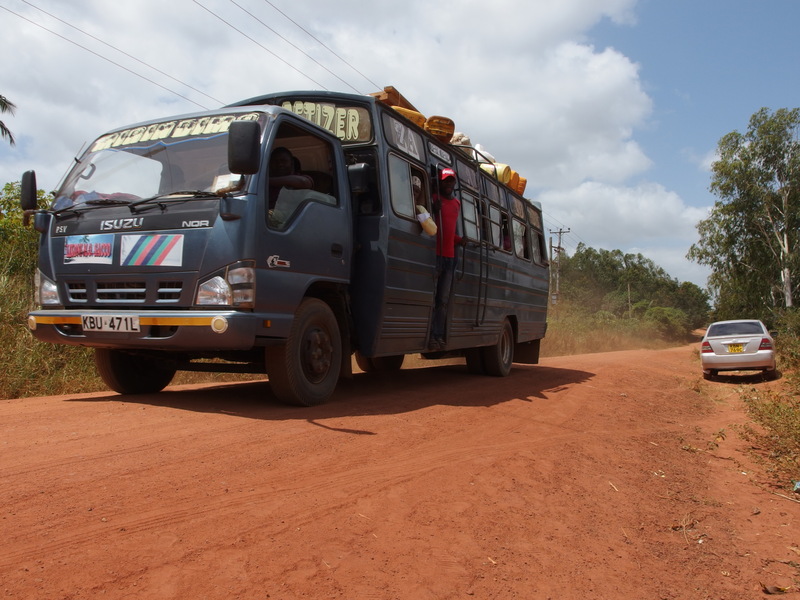 After a grueling 12 hour bus ride from Nairobi to Mombasa, the highlight of the trip was a two hour tuk tuk ride across the ferry and all the way out to Kwale Town. I’m still not sure how it made it up all the hills. Pigs and jiggers: could wild swine be spreading the awful foot burrowing flea? It is a beautiful area. Filled with tropical trees and overgrowth, the landscape looks almost uncontrollable, despite the soil being so sandy that not a drop of water stands anywhere. The air is blistering hot. People don’t get out here much, though the packed buses that pass by every few minutes indicate that the area isn’t entirely isolated. We drop off some gas for one of our drivers, who has to slowly fill his tank, drop by drop, with the tiniest of plastic funnels. Some development project should provide proper plastic funnels to these guys. For some reason, we drive into the bush along a foot path, until we find ourselves wedged between a number of small pine trees. “We have to walk now,” I am told while I wonder why we drove this far anyway. Walking would have been easier. We exit the car, walk through what a patch of neatly arranged trees. A tiny tree farm. I never see this in Western, ever. Coming out, we walk into a compound laid out in a manner wholly uncharacteristic of Kenya. A two story building sporting an upstairs patio complete with a winding staircase to the top, the place looked like the type of patchwork architecture that you associate with off-gridders in the US rather than Kenyan peasants. The Mighty Paraffee turns out to be a kid of about 24, chilling out in the shade. He built this place himself, installed power, has a guest room and an upstairs shower and toilet. His room is decorated with reggae stars and pictures of the saints. Indian music is blaring out of the building. I’ve seen creative interiors from reggae fans in Kenya, but this is something else. This kid should be in architectural school. He even made sure to place the building under a giant tree to keep it cool. I never figure out what the family does for money and no one can tell me, but the mother is exceedingly proud. No jiggers here. We walk on. 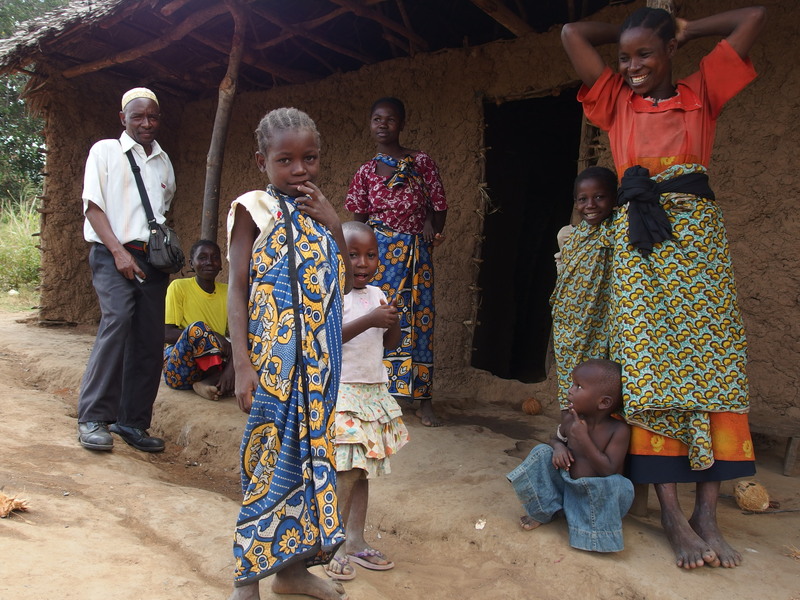 After about a kilometer, we find a poor family sitting outside their house. Children aren’t in school and no one speaks any English indicating that none of them go. Hassan (one or our workers) brings over a little girl and tells me to look at her feet. 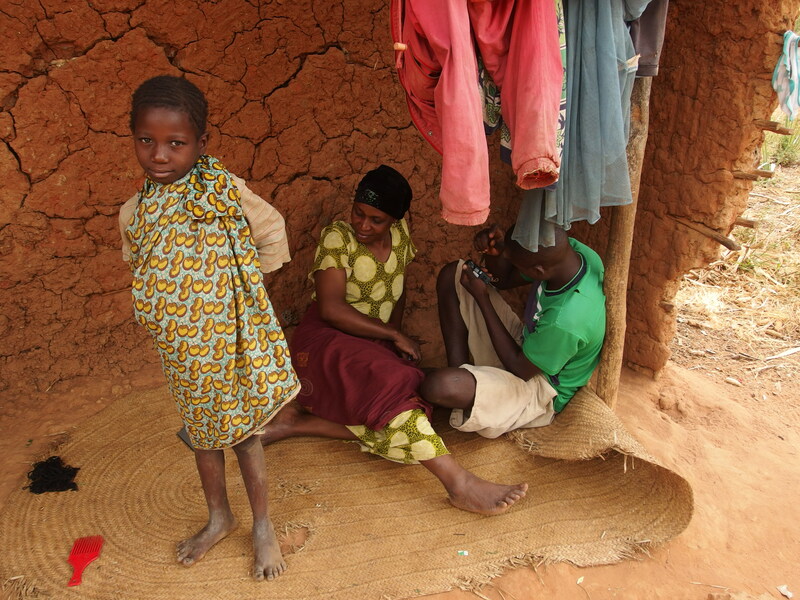 Fatuma is 10 years old and her feet are infested with jiggers. She says the don’t hurt much in the day, but they itch at night. Her brother apparently has them, too. Her mother and her aunt do not. Everyone is barefoot and they all sleep in the same house. I’m wondering if there might be something about the skin which makes kids susceptible while adults are spared. I notice a group of goats in a pen and start asking questions about animals. 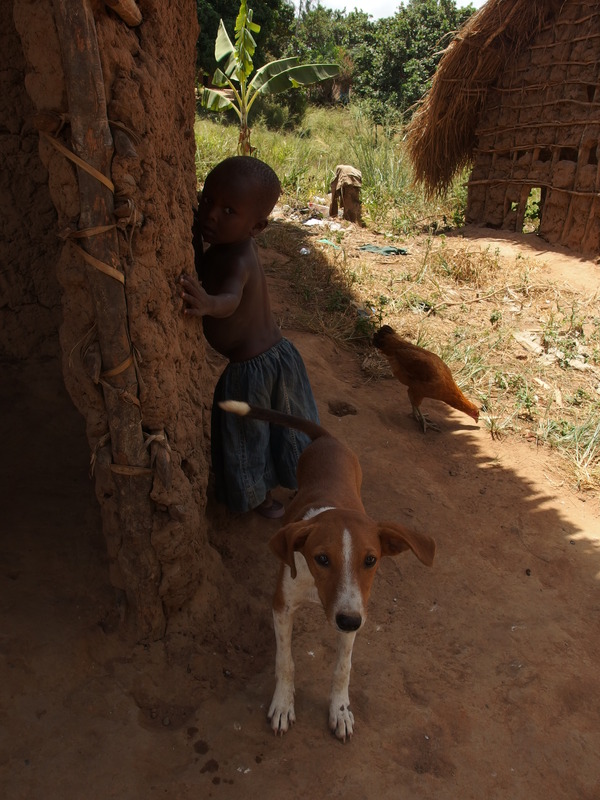 Tungiasis is a zoonotic disease. It is passed from wildlife to domesticated animals to people who bring it into the household and infect their other family members. Or so it is though. Not many people have really explored the question sufficiently. Of course, this is why I’m here. They have about 15 goats, a few chickens and I notice a young dog and a cat walking around. I ask if they ever notice whether the dog ever has jiggers. They say no. “What kinds of wildlife do you see around here?” One of the kids was killed by an elephant last year. There are wild dogs and hyenas which come and try to get the goats. Wild pigs dig up the cassava at night. Pigs. That has to be it. A big mystery has been why there is such a tight relationship between distance to the park and jiggers infections. Wild pigs come out of the forest, raid the fields of the locals and get water from the river, and then recede back into the darkness before morning. 5km is approximately the distance that a pig could feasibly travel and return home in one night. Pigs travel through and around the compound, dropping eggs, they mature and are probably picked up by dogs, but are most likely picked up by kids walking in the bush. They then bring them back home and pass them on to their family members. 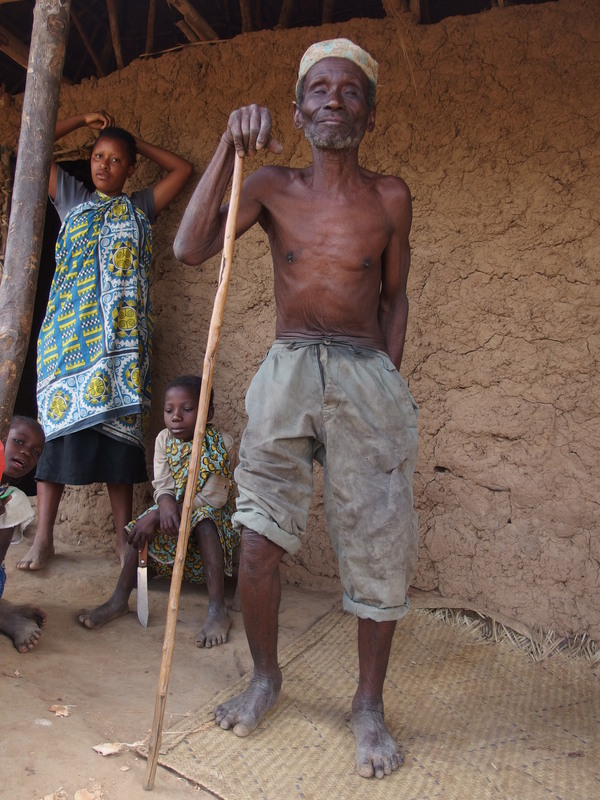 Hassan associates jiggers with mango flowers, but I probe him further and find that the flowers coincide with the very dry season, which could explain why pigs are making the trek to the river and why they prefer the fields since both water and food are probably scarce in the forest. I have to send a student out to investigate this further. An old man comes out. He looks nearly 90, but is mostly likely on 60 at most. He has arthritis in his back. He shows me his feet which are moderately infected, mostly only between the toes. He asks for medicine. I tell him I’ll send some along. 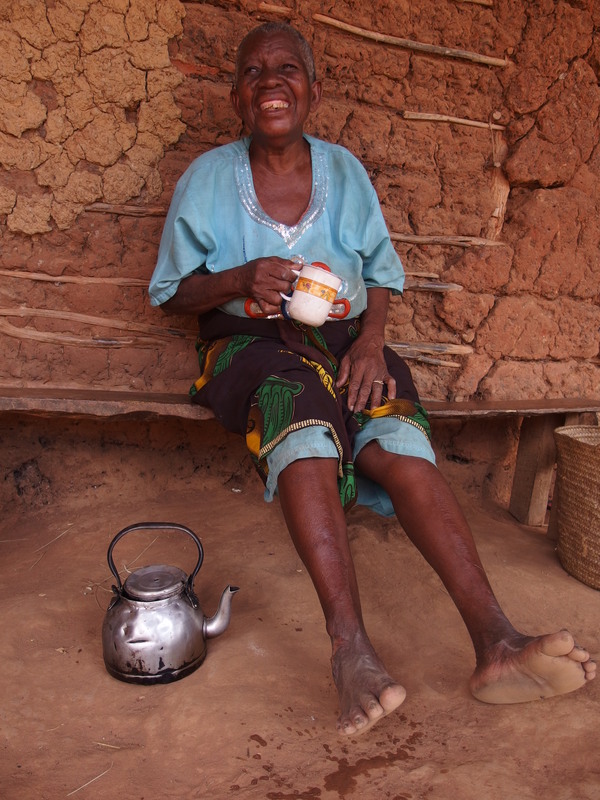 He offers me some boiled cassava which I graciously take. My colleague refuses because there are no cashew nuts with it, but I suspect that he’s worried about getting sick. I become concerned. We take some pictures and go. On the way back, we run into an elderly lady. She’s sitting next to her husband, who is busy getting lit on homemade beer at 11 in the morning. She shows me her feet. 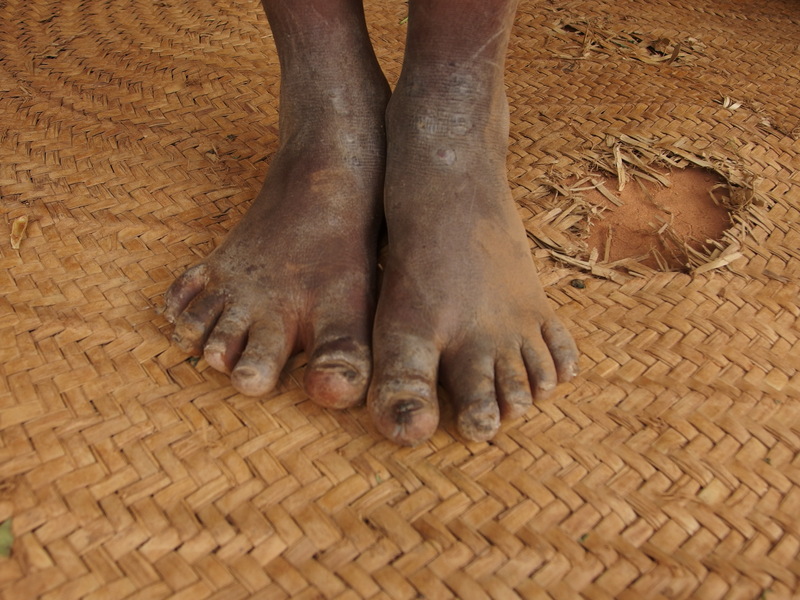 The spaces around her feet are infested with jiggers. It must be horribly painful. I consider making a joke about a snake baby, but think better of it. I’m just amazed that both of them survived. The wound was horrible looking. Somehow, we manage to pull ourselves out of the trees and move on. 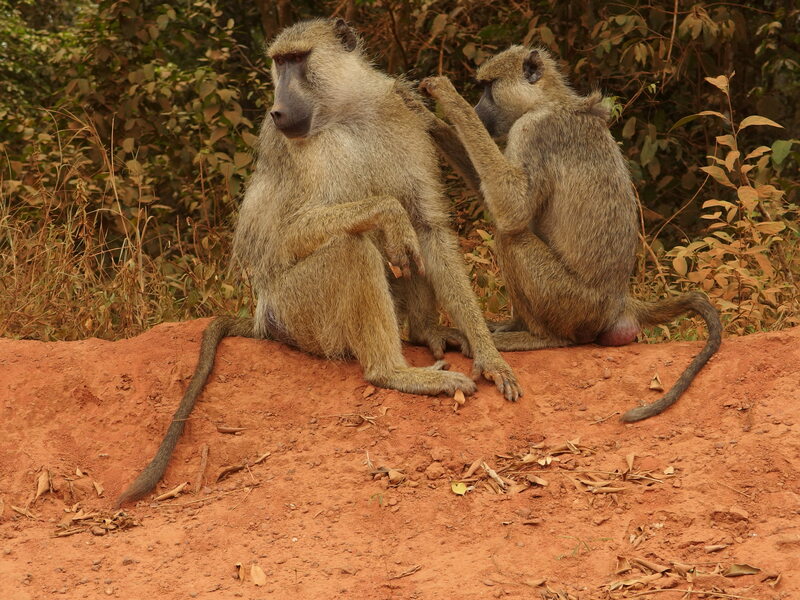 There are some baboons removing mites from one another on the road on the way back, and I take some pictures. My colleague is about to pass out from the heat. I offer to drive.